The next time you are hiring an Ola cab, you may be able to insure your ride for as low as Re1. Cab aggregator Ola (ANI Technologies Pvt. Ltd) recently announced a tie-up with Acko General Insurance Ltd and ICICI Lombard General Insurance Co. Ltd to provide in-trip insurance to its customers. The Acko offering is live in all the 110 cities in which Ola provides services, an Ola spokesperson said. Ola’s partnership with ICICI Lombard will also go live in the coming months, said the company. 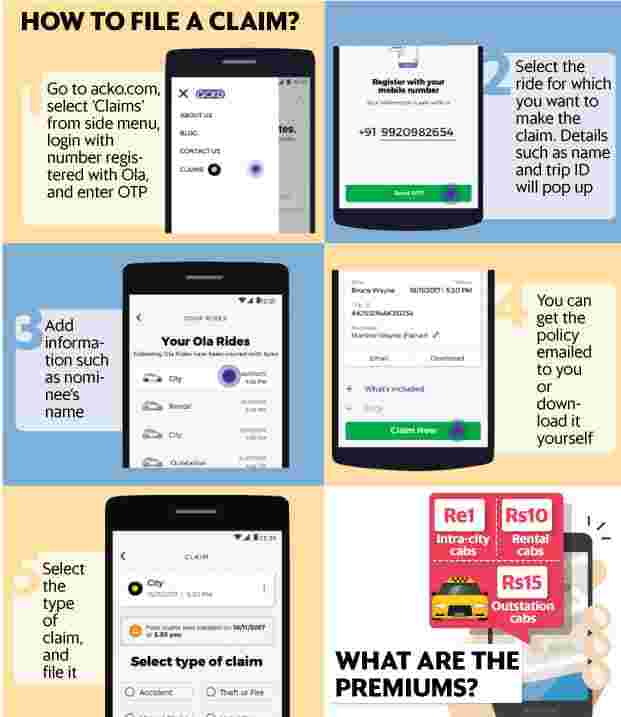 Here’s what the present Acko travel cover is offering to Ola riders. The premiums are different for the three categories of rides that Ola lets you book. For intra-city cabs—Ola share, mini, prime and auto—the premium is Re1 per ride. For rental cabs, which can be booked for fixed distances and durations, the premium is ₹ 0 per ride. For outstation cabs, it is ₹ 15 per ride. A round-trip booking on an outstation cab will be considered one ride, said Varun Dua, chief executive officer, Acko General Insurance. You will find a ride insurance option in the ‘My Profile’ section of your Ola app, and can enable or disable the insurance option through the app interface. All three types of rides have the accidental medical expense (with a cover of Rs1 lakh) that pays for hospitalization due to an accident while you were in the cab, hospital daily allowance (Rs500 per day for up to 7 days), ambulance transportation (Rs10,000), accidental death benefit (Rs5 lakh) and permanent total or partial disability covers (Rs5 lakh). In case of accidental medical expense, the claims can be made cashless if the insurance company is intimated before hospitalization. “However, most accidents result in emergency hospitalization and hence the claims have to be made at a later stage. Claims can be made through our app by submitting the required documents," Dua said. Other covers under the policy include insurance against a missed domestic flight (Rs5,000), loss of baggage or laptop (Rs20,000), emergency hotel requirement (Rs10,000) and home insurance (Rs1 lakh). However, all these four covers are not applicable to all rides (see: www.acko.com/ola/tc). The missed flight insurance is not available to rental cabs and the other three covers are only applicable to outstation cabs. You can make a missed flight claim only if your cab’s estimated time of arrival at the airport is 90 minutes before the scheduled departure. For Ola share and outstation rides, this limit is 120 minutes. This claim can be made only if the destination is specified as airport at the time of booking. If the destination is changed during the ride, the claim won’t be admissible. The cover will be available only if a cab is booked through the Ola app. Under the electronic equipment cover as part of the loss of baggage cover, only laptops are included, but not mobile phones. Similarly, it does not cover loss of valuables like cash or jewellery under both loss of baggage as well as home insurance (including for theft, fire and allied perils). The claims can be made only after an FIR is lodged and it confirms the specific loss of baggage. Similarly, in case of a home insurance claim, an FIR confirming that the loss happened when you were on an outstation trip will be needed. Claims under this category (this is true for all claims under the policy) won’t be entertained if the number of passengers (including driver) is more than the vehicle’s seating capacity. “It is a good concept, but the customer should get the policy certificate, and the claim process and time-frame should be well-defined," said Prakash Praharaj, founder, Max Secure Financial Planners. While the premiums are really low, especially for intra-city rides, you will have to decide if you need it depending upon the covers you already have.